Malaysia’s love for the “King of Fruits” a.k.a the durian is undeniable! But at RM30 – RM50 per fruit, they’re not exactly affordable. That’s why, this Saturday only (16 July 2016), between 11am – 6pm we’re bringing back #GrabDurian! For all of you durian lovers in the Klang Valley, Penang and Johor Bahru, we’re offering a durian for only RM10 and delivering it to you for free! Just book yours with credit/debit card on Grab. There’s a variety of Durians on offer from Musang King, D24, D100 and more. So get your tastebuds ready, the pungent perfection, the spiky sensation, the #GrabDurian … is on your way. 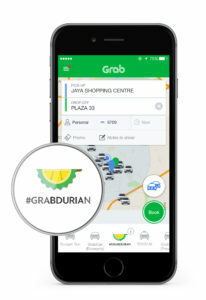 Share this great news with your friends and family to enjoy #GrabDurian. And if you’re at Bangsar this Saturday at 11am, come find us near Bangsar Village 2 as we’ll be giving away free durians to the first 100 lucky people. All you need to do is be on a lookout for our “6 Packs Man” and snap a photo with them to share your social media and you’ll walk away with a packet of durian! Be there early, as this free promotion is only for the first 100 lucky people. Here’s How to Book Your #GrabDurian ! Key in your pickup and drop-off location (both must be the same address). Select Payment Method (Credit / Debit Card only) & select Next. Book your #GrabDurian and the durian will be delivered to your doorstep! This promotion is only valid for Grab users in Klang Valley, Johor Bahru and Penang. This promotion is valid on 16th July 2016 only. Valid for bookings under the #GrabDurian icon only. This promotion is valid for first come first serve basis. Each booking is entitled for one (1) durian only. Durian type may varies for each delivery and passenger are not allowed to select which type of durian being delivered. Payment method must be via credit card or debit card only. Delivery of the durian will be done within a time limit of 1 hour from the booking time. The Campaign will run on 16th July 2016 (“the Campaign Period”). The Organiser reserves the sole and absolute right to alter or end the Campaign at any time prior to the expiry of the Campaign Period without giving any prior notice and no compensation in cash or in kind shall be given.